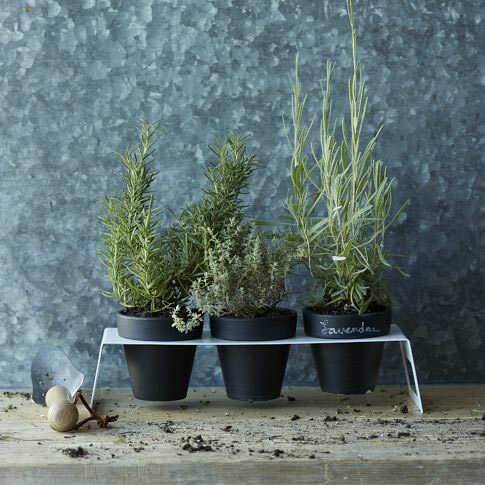 Plant a mini herb garden with West Elm’s Chalkboard Planter Set. Photo courtesy of West Elm. Today is National Herb Day, so why not celebrate?! Herbs are nature’s medicine and an important part of health and wellness, whether you use them for culinary, medicinal, or beauty reasons. They can also be used in many other creative ways, such as cleaning and decorating, so why not incorporate them into your everyday life? Check out these great uses for herbs and try one today to celebrate Herb Day with your friends and family! Arrange an Herbal Bouquet. Fresh out of flowers? No problem. Herbal bouquets are just as fragrant and beautiful as fresh flowers. They look especially fantastic on a dinner table when placed in odd numbers in bud vases and interspersed with some tea lights. Rosemary, which has a revitalizing fragrance, is a favorite of mine and will last several days with frequent water changes. For some extravagant bouquet ideas, check out the book Herbal Bouquets by Emelie Tolley. Clean with Herbs. Yes, you heard me correctly. Herbs are full of wonderful antiseptic qualities which make them perfect for green cleaning! You can use black or green tea to clean due to its antimicrobial qualities or if you have some herbal essential oils on hand, such as peppermint or lavender, try whipping up this All-Purpose Aromatic Vinegar Spray or Aromatherapy Cleanser. Create Herbal Ice Cubes. Got left-over herbs? Use them to make ice cubes and the next time you cook, simply drop an ice cube in your sauté pan or a pot of soup for fresh, herbal flavor. Of course, they’re great to add into drinks, too! Some popular herbs to try are basil, parsley, and mint. Decorate with Herbs. Herbs are great for all kinds of decorating, such as making wreaths, sprucing up napkin rings, and dressing up a fireplace mantel. Make your own or buy ready-made decorations, such as this fragrant Kitchen Herb Wreath from Creekside Farms. Indulge in Herbal Spa Treatments. Whip up an all-natural herbal spa treatment, such as this Rose Milk Bath or Lavender Body Scrub and feel renewed and re-energized! Mix Herbal Spa Drinks. One of my favorite spa water recipes uses fresh mint with flavorful blackberries. Add some peppermint or spearmint leaves to a pitcher and “bruise” them with a wooden spoon to release their natural essential oils. Then add water and a handful of blackberries. Let it sit for a few hours in the refrigerator, so the flavors infuse the water. Serve chilled with a sprig of fresh mint in a cocktail glass for extra appeal. Plant an Herb. Growing your own herbs is great, because you always have what you need on hand and you can choose to grow them organically. Try some popular, easy-to-grow herbs, such as peppermint, rosemary, basil, thyme, oregano, and bay leaf. All of them do well in pots or in the ground. Make an Herbal Sachet. One of my favorite things to do is make herbal sachets that can be used in lingerie drawers or in the dryer to impart a beautiful, natural scent to your clothing. Some herbs, such as bay leaves, also work naturally as an inspect repellent, so they do double duty! Check out my recipe for Luxurious Lavender Mint Dryer Sachets. Share a Pot of Herbal Tea. Nothing’s better than a fresh, brewed pot of herbal hot or iced tea shared with family and friends. If you add sweetener, try some stevia or agave syrup, which won’t spike blood sugar levels like processed cane sugar does. Walk Through a Botanical Garden. Most botanical gardens have a section dedicated to herbs. Take a break from you day, enjoy nature, and check out some herbs! Give an Herbal Gift. What better way to show someone you care than to give them an herbal gift? Check out “10 Great Herbal Gifts” for some ideas.